In this walkthrough, we will show steps for installing and configuring Web Deploy for administrator or non-administrator deployments. This means the steps necessary to enable a client to use Web Deploy to publish Web site content to the server, even if the client does not have administrator credentials for the server. Note: Currently Web Deploy V3 RTW is only available through direct download. We are still working on WebPI feed. Easiest way to install V3 RTW is to first install Web Deploy V3 RC using WebPI 4 RC (x86/x64) as instructed in Installing & Configuring Web Deploy tutorial, and later update it running Web Deploy V3 RTW msi. The server must have an operating system that comes with IIS7— this means either Windows Server 2008 or Windows Server 2008 R2. 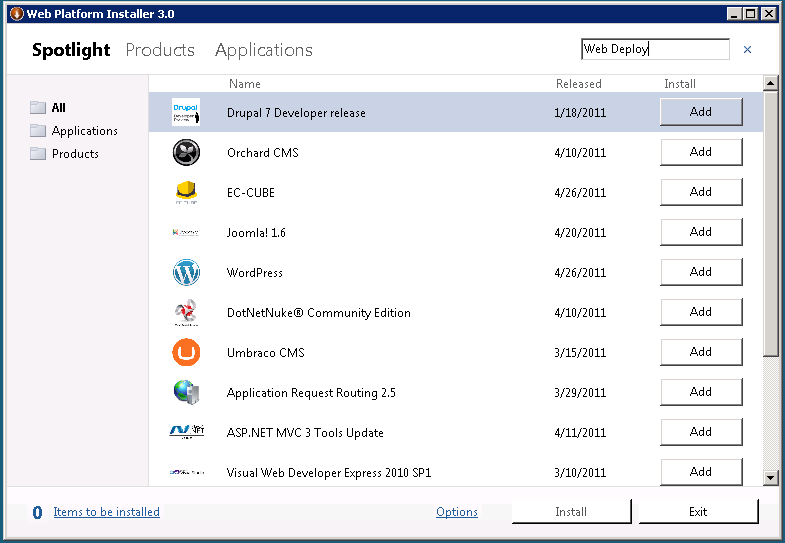 Add the "Web Deployment Tool 2.1 for Hosting Servers" product and click Install. 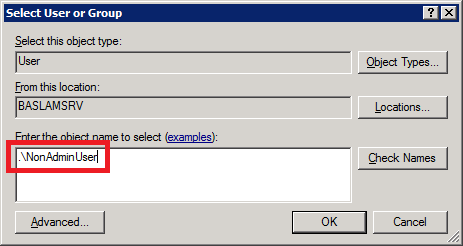 In the Setup wizard choose the "Complete" setup option. The MSI will not install SQL Shared Management Objects (SMO), which is required for the SQL Server database deployments. This component may be installed using WebPI to enable SQL Server database deployments. The MSI will not install the Web Management Service handler component if the Web Management Service is not installed; the handler component is necessary for non-administrator deployments. Windows component IIS, including Management Service, should be installed first to enable the handler component to install. The MSI will not configure Web Management Service to allow non-administrator deployments if PowerShell v2 is not installed. This setup step includes creating delegation rules in the IIS server Administration.config file that allow non-administrator users to use Web Deploy. PowerShell v2 is built-in on Windows Server 2008 R2 but may require a Windows Update for Windows Server 2008. Alternatively the delegation rules may be added manually after install. 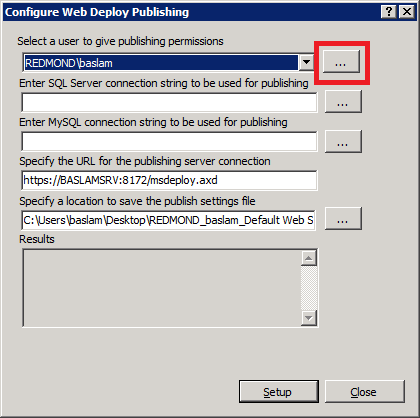 After installing Web Deploy using method (1) or (2a), described above, all server-level configuration is complete for non-administrator publishing, however additional configuration is required at a site level. This site configuration can be accomplished using methods (1) or (2) described below. Expand the Sites node and right click a site, such as "test"
The non-administrator Windows user (NonAdminUser) may now publish to the site (test). 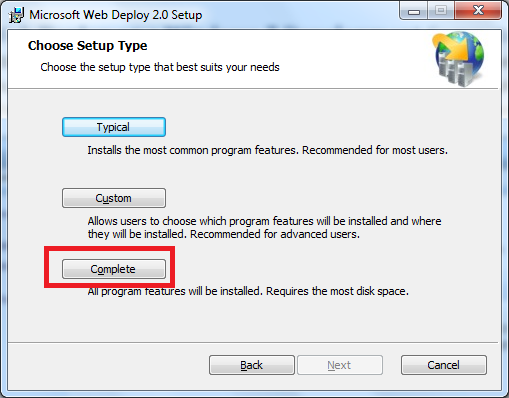 Install Web Deploy using method (1) or (2a) described above. If you are using a client operating system such as Vista or Windows 7, or a Windows server version without IIS7+, such as Windows Server 2003, you will need to choose the Web Deployment Tool 2.1 product option in the Web Platform Installer (in install method 2a), or install directly from the Web Deployment Tool download page (install method 2b). For these client or server 2003 machines the Web Management Service handler component and associated delegation rules will not be applicable. Make sure your firewall allows connections to the service you are using. By default, the Web Deployment Agent Service (MsDepSvc) listens on port 80, and the Web Management Service (WmSvc, also called the "handler") listens on port 8172 by default. 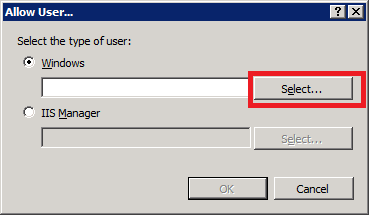 You must run MsDepSvc by using the built-in Administrator account, or from a domain account that has been added to the Administrators group. A local administrator which is not the built-in account will not work with MsDepSvc. Symptoms: .NET 4.0 is installed, but there are no .NET 4.0 application pools or handler mappings in IIS. You cannot browse to applications that use .NET 4.0 (for example, applications based on WebMatrix's site template applications) after you publish them. Cause: Your machine had .NET 4.0 installed on it before IIS was installed.